4.1 out of 5 based on 138 bloggers and 12 commenters. To add the slider: search the corresponding file in the template folder, copy and edit the code. and paste it in a new html gadget. To add the social icons: search the corresponding file in the template folder, copy and edit the code. and paste it in a new html gadget. 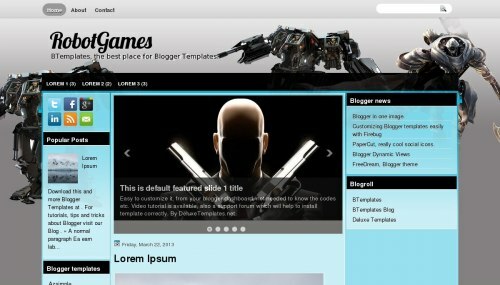 RobotGames is a free blogger template with 3 columns, left and right sidebars, slider, social bookmarking icons and 3D effect. Excellent template for blogs about games or kids. I want some tamplet for my blog checck my blog n plz reply me which one realy suits it. Thank you for your comment! If it contains links, your comment will be moderated. If you’re looking for technical support, please see the FAQ’s, our blog or contact the original author. legall template. you must fix it!